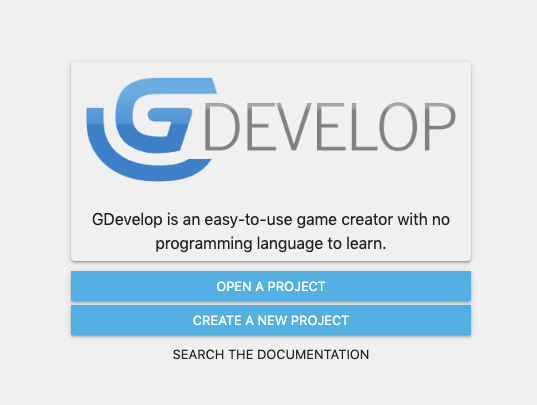 To get started, you can try GDevelop online. 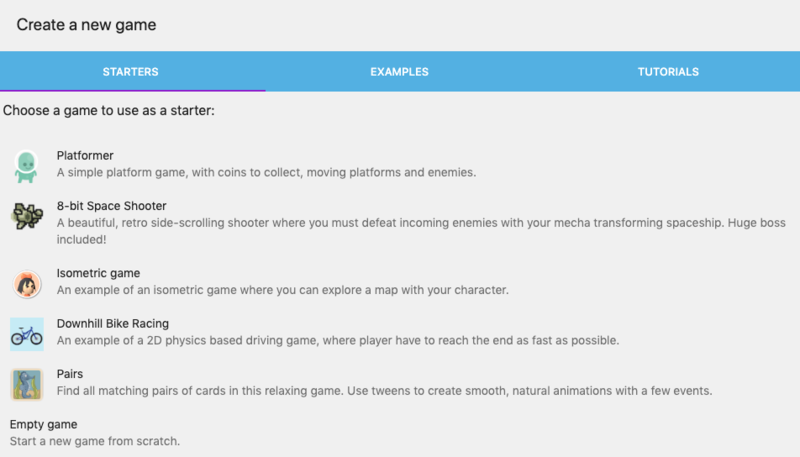 To create your own game, save and then publish it, download the desktop version on GDevelop website. When you have downloaded GDevelop, open the installer and install the software. On Windows machines, use the GDevelop icon on your desktop to launch it. On MacOS, open GDevelop from the Applications folder or drag it to your dock for permanent placement. Once the application is launched, you will be presented with the start page. The start page allows you to open an existing project or to create a new project. To create a new project select the relevant option on the start page. A new window will open. This window presents a list of options that allows you to choose from templates/examples or to create a blank project. The examples contain a template that is already to use. The template includes some assets and events to get you started. Selecting the blank project includes no assets or events. Think of it as you would a blank sheet of paper. This template allows you to start from scratch. At the bottom of the window, you can select the location where would you like to store your new project. Once you have selected the default location for your project, click on the name of a starter template or an example to open the game. To re-open an existing project, select the relevant option on the start page. Next, browse your local file system to open a project. GDevelop 5 project files are normally saved as “.json” files. Find it in the file menu that opens and select it to open the game. The icon for this file depends on whether or not you have any default application installed on your computer to edit a “json” files. macOS and Linux: GDevelop Projects directory in your home folder. Once you have the project open, you will be presented with the Gdevelop editors. Just as you've seen when you created a game for the first time. Note: GDevelop 4 users, you can learn here how to save your project to open it with GDevelop 5. Continue reading the basic concepts to know how to use Gdevelop. The tutorials, along with the documentation, are the best ways to learn. It is highly recommended that you read and follow a tutorial! Be sure to check all examples bundled with GDevelop! They are a good way to learn about the different capabilities of the software.